Matt Bianco’s excellent tunes for curing the Winter Blues in Budapest! MOM Sports Swimming Pool and Sports Center’s – Great Hall – Budapest. February, 7. 2015. – 8.20 p.m. – Budapest. 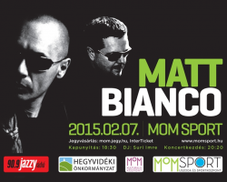 Time goes by … but Matt Bianco’s song lovers the time is here again because he conquers Budapest! Way back in the early eighties, one of the popular British group by the name of Matt Bianco spinned with their hits into the leading pops-of-the-pops. Most probably many in the early days thought the lead singer of the group name as Matt Bianco, but was the helm of the group. Funny or not, both being most fond of spy stories, the name came from a fictitious, assumed name from a certain a spy story. The real name of singer is Mark Reilly and on keyboard players Mark Fisher. Many local and international music broadcast stations and music TV, day-by-day shooting their bakelite that hit pretty soon the charts. Matt Bianco unique style was new in the musicland … Jazz – Pop – Latin rhythms. In the ’80s the band was founded by bass player Kito Poncioni, Mark Reilly and Danny White on keyboards. They banged into the pops with their first hit in ’84 – „Get Out Of Your Lazy Bed”. Their music got even more exciting when Basia, with the temperamental Brazilian toned female voice joined the group.The huge success was cut when Basia and Danny White went onto their separate ways. Afterwards, Mark Reilly had ups-and-downs on their way. Shortly after that the session musician Mark Fisher joined the group things sorted out. Emilio Estefan, Gloria Estefan’s husband – music producer lend a hand in helping to burst out a new hit, the so-called lost in space group could make a hit song that brought them alive again „Do not Blame It On That Girl”. In the mid 2005, Danny White and Mark Reilly met again and the reunion brought really successful rendezvous and also Basia again joined the legendary team. The year 2009 brought higher success when Mark Reilly and Mark Fisher came together again and released one album the Bossanova HiFi, then after following by the Hideaway album. All time favorite: https://www.youtube.com/watch?v=r1RK25XleEE … For me can’t beat it.